The software is the software of a computer system. It is the intangible part of a computer. It differs from hardware, which is the material part. It is a broad category that includes a wide variety of computer products, from operating systems to the intangible part of electronic games or the programs that allow the operation of an airplane. Correction: That it fulfills its objective. Usability: Make it easy to learn. Security: That is resistant to external attacks. Flexibility: That can be modified by the developers. Portability: That can be used with different equipment. However, not all software products meet these requirements, as they prioritize one or the other depending on the use that will be given. For example, the software of a washing machine does not require prioritizing security, since it does not protect any type of important information. The system software is everything that is called “operating system”. Among them are Windows, Mac OS, Ubuntu (among other distributions of Linux), Unix, Fedora, and Solaris, among others. It is the main software of a computer system and is responsible for managing both hardware resources and application programs. Its execution is privileged over that of the rest of the software since everything depends on the operating system. In addition to operating systems, device drivers, diagnostic, correction and optimization tools, servers and utilities are included in the system software. These are the programs we use regularly to perform all kinds of tasks on a computer. Its function is much more specific than that of the system software. These include word processors (such as Word or Notepad), editors (such as Photoshop or Gimp), spreadsheets (such as Excel), communications programs (such as Messenger or Whatsapp) and design programs ( as AutoCAD) among others. Since software is a software and not an object, software is not manufactured but developed. The developer can be a programmer or a team or a company with several teams. When it comes to a team, a developer can deal with the general vision of the project and others with the programming tasks of each of the components. However, in all cases, the team of developers must maintain constant communication so that the resulting software is functional to its objectives. Each programming language is formed by certain symbols and syntactic and semantic rules, meaning that for each language the symbols have their own structure and meaning. Variables are memory spaces, that is, data containers. Vectors are a specific type of composite variables. Are the necessary premises for the program to run. They execute a code constantly whenever a premise is fulfilled. They are variables that enclose a code in themselves. The software allows interacting with objects, that is, with hardware. Currently, an important part of all the products in common use include some kind of software, not only computers and telephones but also microwaves, automobiles, airplanes, refrigerators, televisions, music players, among others. The software is intrinsically evolutionary since its use allows to discover not only failures but also potentialities that require further development. Therefore, all programs and operating systems usually offer upgrades or updates soon after they have been released to the market. 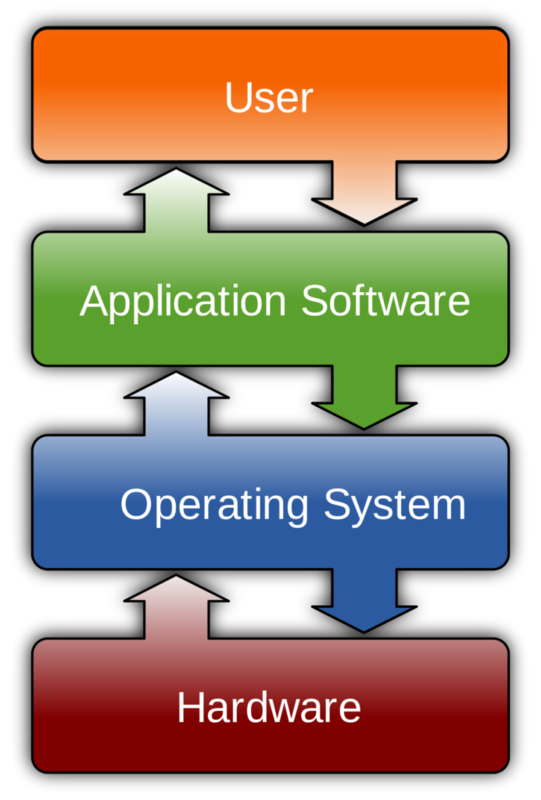 Installation is the process by which a software is integrated into the operating system of a computer. The installation requires a specific type of configuration that allows you to properly interact with other programs and hardware. There are also distributed installations, that is, the same software is installed on several computers at the same time. It is called free to the type that allows access to its code, that is, to its operating matrix and that therefore any user can install it, use it and even modify it. Free software is promoted by a movement that was consolidated in 1985 with the founding of the Free Software Foundation, which signals the freedom of the computer user as an ethical goal. Some types of requiring a periodic process of control, improvement, and optimization. These processes include the debugging of errors and in some cases also the updates offered by the developer. In some cases, maintenance includes sending a report to the developer, in order to collaborate with the evolution of the software.